Escape the more crowded city center with a visit to Yoshimine-dera, a temple nestled in the mountains on Kyoto’s southwest border. 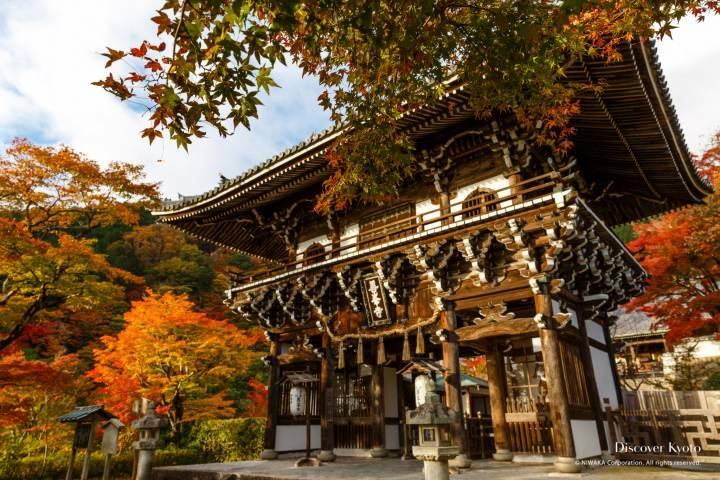 This storied temple complex boasts magnificent views of the city and is well known for its seasonal offerings, which include gorgeous autumn colors, ephemeral cherry blossoms, vibrant azaleas, and lush hydrangeas. 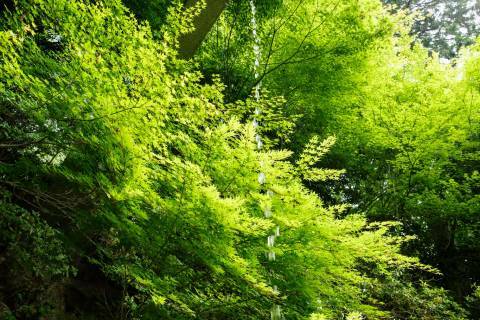 Also home to what is said to be the best pine tree in Japan, Yoshimine-dera overflows with natural energy, no matter where you travel on its paths that connect various Buddhist halls across the mountainside alongside pilgrims worshiping Kannon, the bodhisattva of compassion. Though it may be off the beaten track, don’t miss all that Yoshimine-dera has to offer! Make sure to explore the nooks and crannies of this temple complex, because there are so many small details and gorgeous scenes just waiting to be discovered! Despite its remote location, Yoshimine-dera is a popular temple during several specific seasons. The autumn colors (kōyō) envelop the entire mountain, but in spring and summer it’s time for the Hakusan Sakura and Hydrangea Garden to shine. This sprawling garden is laid out under the watchful eye of the Kōfuku Jizō (Jizō of Happiness) installed on a raised platform, and walking paths meander over the mountainside between lush clusters of hydrangeas and cascading weeping cherry blossoms. 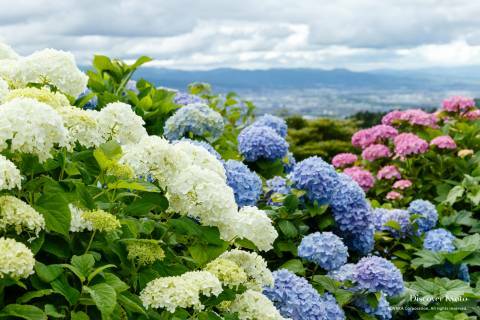 Said to contain thousands of hydrangeas, many of them the blue mop head variety, the garden scenery is gorgeous in most any weather, even rain. Designated as a natural moment, Yōryū no Matsu is a Japanese white pine said to be over six hundred years old. Trained to grow horizontally rather than vertically, this pine tree, propped up by wooden supports under which visitors can pass, is a whopping 37 meters long! (It actually used to measure at 50 meters, but had to be trimmed down in the nineties on account of pine weevils.) This pine received the name “Yōryū no Matsu” (遊龍の松) in 1857 from Kazanin Ieatsu, a high ranked courtier, who likened the shape to a playful (遊) reclining dragon (龍). When you visit Yoshimine-dera, be sure to examine the tree known as Japan’s best pine from various angles and distances until you can see just how it earned its name. 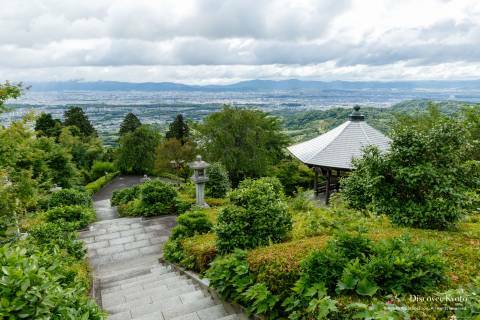 Situated as it is in the mountains bordering Kyoto on the west, Yoshimine-dera has several spots that offer sprawling views of the city below. Many of these areas are festooned with seasonal flowers, adding another layer of beauty to the scene, such as the hydrangea-lined low wall walkway on the approach to the gardens, or the azalea-rimmed lookout near the Shaka-dō hall. From some angles at the top of the stairs leading to the Yakushi-dō hall the path seems to lead down not to the temple, but to the distant city below. On clear days you can pick out various landmarks such as Kyoto Tower and even see across the valley basin to Mt. Hiei in the east. Many of the structures at Yoshimine-dera date to the 17th century Edo period reconstruction funded by Keishō-in, Kyoto native and mother of the fifth Tokugawa shogun. Visitors first enter the temple through the stately two-storied rōmon gate and soon encounter the temple’s main hall, the Kannon-dō, which enshrines the temple’s principal image and secondary principal image, both statues of the Thousand-Armed Kannon, the bodhisattva of compassion said to possess one thousand arms with which to save the suffering. Next to the temple’s tahōtō pagoda is the Kyō-dō (Sutra Library), which is dedicated to Fudaishi, a Chinese monk considered a patron deity of libraries. Praying at the Shaka-dō that houses the historical statue of Buddha Shakyamuni is reputed to offer relief to those afflicted by lower back pain or neuralgia. The second highest point in the temple complex, the Yakushi-dō hall, enshrines Yakushi Nyorai, the Medicine Buddha, and had a special significance to Keishō-in, who is said to have only been born because her parents prayed to Yakushi Nyorai on this mountain for a daughter. Make sure to explore the nooks and crannies of this temple complex, because there are so many small details and gorgeous scenes just waiting to be discovered. Yoshimine-dera was founded in 1029, when a monk from Enryaku-ji temple on Mt. Hiei named Gesan came to the western mountain to establish a retreat for himself. It is said that as he was looking for the proper place, an old man appeared when he stopped to rest, declaring himself to be Achisaka Myōjin, the local god, before asking the priest to found his temple there. Convinced, Gesan set about building his temple, but encountered a problem when he realized that the land was so rocky as to cause difficulties in construction. In legendary fashion, that night he was given a vision that help would arrive, and it came in the form of a team of wild boars who leveled the land in a single night. Gesan was then able to carve a statue of the Thousand-Armed Kannon for worship and build a small temple, which he called Hokke-in. A few years later in 1034 the temple was given the name Yoshimine-dera when Emperor Go-Ichijō designated that prayers for the protection of the state be carried out there, and in 1042 Emperor Go-Suzaku offered up an additional Thousand-Armed Kannon statue as the temple’s principle image. With the now established tradition of imperial patronage continuing through the reign of many emperors, Yoshimine-dera began to expand in size and prestige both. By the Kamakura and Muromachi periods Yoshimine-dera had grown from a single monk’s private retreat to a sprawling temple complex with over fifty priest’s quarters. Unfortunately, like many places in Kyoto, Yoshimine-dera was devastated by the Ōnin War in 1467. For nearly two centuries the site lay neglected, until Keishō-in, the mother of the fifth Tokugawa shogun, sponsored its revival in the Edo period by contributing various halls and valuable furnishings and tools. Originally a grocer’s daughter from Kyoto before she became one of the shogun’s concubines in Edo (Tokyo) and found her position elevated by virtue of her son rising to power, Keishō-in devoted herself to Buddhism in her later years, and many sites on the temple grounds relate stories of her life. 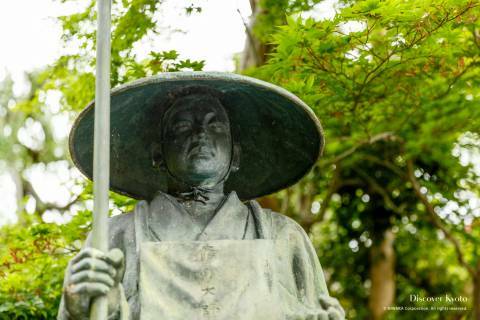 To this day, Yoshimine-dera is visited by pilgrims in straw hats clad in white as the twentieth of the thirty-three sites on the Saigoku Kannon Pilgrimage, a route connecting temples in the Kansai area that worship the bodhisattva of compassion. © 2019 NIWAKA Corporation. All Rights Reserved.